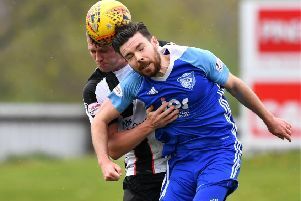 It took a stunning goal right on half time to ensure Peterhead made it three wins this season over Annan and keep the pressure on Stirling Albion and Montrose as the race for promotion continues to look like being a closely fought affair. Atrocious weather conditions made good football impossible and this encounter could easily have finished with a draw, the visitors striking the woodwork twice in the latter stages in addition to one in the first half. Simon Ferry returned to the midfield after being rested due to Clyde’s artificial pitch the week before and Mason Robertson took his place in defence and put in a superb performance. Marc Lawrence and Jamie Stevenson sat this one out, both injured. In very blustery conditions at Balmoor Stadium, Peterhead dominated from the kick off with Simon Ferry hooking an early chance from a corner kick over the crossbar from six yards out. It took until the 19th minute before we had any other chance of note, Rory McAllister cutting the ball back from the right side of the penalty area for Jack Leitch whose 12 yard shot was deflected out for a corner kick. Seven minutes later goal hero from last week, Russell McLean tried his luck from distance but Jim Atkinson held the shot with ease. Just past the half hour mark Annan broke forward and Dan Orsi had an angled shot cleared off the line for a corner from which the visitors had three chances to score with shots coming off the bar then cleared off the lined in a crazy spell of action. Then right on half time the Blue Toon were awarded a free kick fully 25 yards out and McAllister crashed home his shot into the top corner for a rare moment of quality. The second saw the wind go from stiff to ferocious with passes difficult to execute and control. Ten minutes after the restart Peterhead were awarded another free kick a similar distance out to the first with McAllister this time opting to go low with keeper Atkinson doing well to hold the effort first time. In the 67th minute an Annan free kick also caused havoc, this one from 30 yards out hit waist height which home keeper Greg Fleming saw late and did well to turn around the post. Peterhead should have wrapped it up four minutes later, a Scott Brown cross finding McAllister but his firmly struck shot flew over. Eight minutes from time Aidan Smith broke clear for Annan and looked like leveling but his low shot from an angle to the right of goal drifted agonisingly wide of the far post then moments later an Owen Moxon shot from 22 yards hit the post as Athletic went for a point. Blair Henderson hit the upright soon after as the home goal lived a charmed life but sub Jordan Brown could have made the points safe for the Blue Toon in the dying moments but fired wide when well placed to score from a Nicky Riley pass. On Saturday Peterhead make the relatively short trip to meet their old adversaries Elgin City for what should be an entertaining encounter at Borough Briggs.